On the Show Topic: Coaching Stories from players. Were you ever turned off from the sport because of a coach you had? Were you motivated to play your best because of a great coach? I have been away from reporting on women’s tackle football for a very long time. 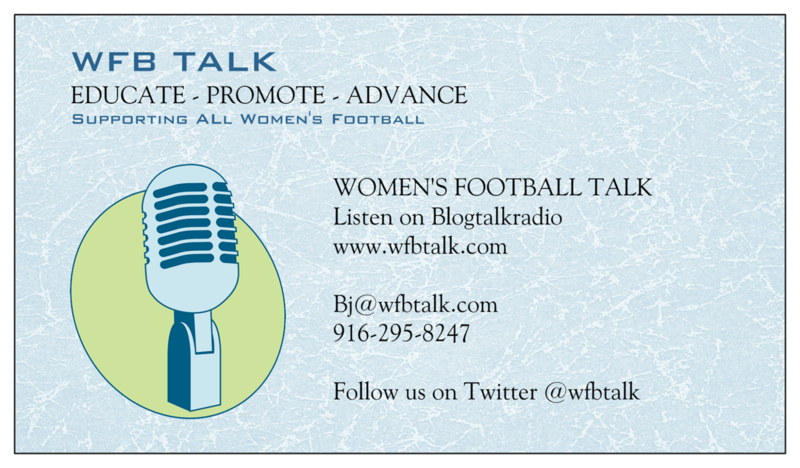 I first started WFB Talk (Women’s Football Talk) in November, 2006. 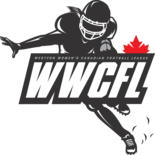 The WPFL (Women’s Professional Football League) and NWFA (National Women’s Football Association) were still around. First with the blog and then the internet radio site, Blogtalkradio, where we did a live broadcast show every Sunday throughout the year, not just the season, but the whole year. I stopped in 2012 with the show, doing my show WFB Talk, that is. I still upload shows for the IWFFA (International Women’s Flag Football Association) on the WFB Talk site though. Oscar Lopez, of Gridiron Beauties helped host the show for me during 2012 and then when I finally left he created his show, which is #1 in reporting women’s football. WFB Talk had four co-hosts. There was Beebe, Meg, Robin and myself. Our very first show was nine years ago on the “History of Women’s Tackle Football”. Over the years we had many wonderful guests and great interviews. The reason to why I am bringing this up is that I want to return back to reporting on women’s tackle football. Start from scratch and earn my way back. I will be starting a new show using a pseudonym rather than my actual name and I will be handling only one league. I’ve been away much too long to jump with both feet in. I write this publicly because I don’t want you to think that I am deceiving you, but rather trying to work my way back into the game. Hope to see you “Over-the-air-waves”. Last year the Blondes and Brunettes from Santa Barbara, CA raised $86,000 and this year they raise the bar even higher hoping to raise $100,00! Kirstin explains about the team and event. They begin recruiting in March for their July 23 game. They search other sports leagues, flier up all over town to find their future flag football players. The women come together for the event, however they have formed friendships off the field as well. What happens if any Blonde player should dye her hair? Will this group turn into a league? We know for sure that blondes definitely have more fun. Assures us there will be a new league for women’s flag football in Santa Barbara. He describes the rules, the Blondes vs. Brunettes history and shares some inside information about the team. Who will win the big game on July 23? Shawn’s affirms it will be the Blondes. Welcome to Rival, where two teams of women divided to reflect rivalries such as East vs. West or Blondes vs. Brunettes compete in a flag football game to inspire fundraising, awareness and action in the fight against Alzheimer’s disease. Looking to get involved? We need dedicated players, but we also need coaches and volunteers. Want to cheer from the crowd? Donate to one of our players and you can receive admission to the game. It’s time to pick a side! Together, we can tackle Alzheimer’s. and $72,000, was raised for Alzheimer’s Disease, and they raised more than previous year. Invitadas: Briseida Beltran, Olga Flores, Athenas Castro, Jackelyne, Alejandra Corrales, Kimbely Lemus y Karen Cruz, Nelly, Alison del Cid. Este torneo contó con la participación de 7 equipos de diferentes países. Copanecas, Linces, Guaras de Honduras, Cuscatlecas, Barbarians, Spartans de El Salvador y Vikingas de Guatemala. Briseida Beltran: Fue la encargada de la organización del torneo, ella juega para el equipo Cuscatlecas y es la representante de su país para la IWFFA. En nuestra conversación ella explica que para el evento, contó con el apoyo de las compañeras de Cuscatlecas y los demás equipos para lograr el éxito del 1er torneo en El Salvador. Además de indicar que fue de su agrado que todas las chicas convivieran y disfrutaran de cada parido y también fuera de la cancha. Olga Flores – Reciever y safety del equipo de Barbarians El Salvador indica que el torneo le pareció excelente y que lleva 2 años practicando flag. Comenta que se prepararon entrenando 3 veces por semana para poder hacer una buena competencia. Athenas Castro – Mariscal de campo del equipo Guaras de Honduras, tiene 4 años de experiencia jugando flag en diferentes modalidades, aunque la modalidad de 8 es una de sus favoritas. Indica que le ha gustado el torneo, sin embargo no le pareció el arbitraje y considera que se debería hacer una reunión para tratar de aclarar puntos del reglamento. Considera que los equipos tienen una excelente oportunidad de compartir y aprender de los otros equipos y así tener más competencia y que aumente el compañerismo. Alejandra Corrales – Safety equipo Linces de Honduras. Alegre de compartir con los equipos y de disfrutar de la competencia. Ella comenta que tiene 3 años de experiencia jugando Flag. Tiene 3 meses de jugar en el quipo y comenta que es un deporte que la apasiona y disfrutando de su primera experiencia en un torneo. Además habla sobre el tema transgénero en los equipos de flag. Ella indica que es una posibilidad ya que el flag no requiere de un contacto agresivo y que además podría haber la posibilidad de que ellos crearan sus equipos. Karen Cruz – Entrenadora de equipo Vikingas de Guatemala. Cometa que como inició Vikingas en Guatemala y de la experiencia de la mayoría de las jugadoras que pudieron viajar, compartir y aprender del primer torno de la IWFFA en el Salvador, además comenta sobre la algunas de las dificultades en el torneo y sobre todo de como la convivencia entre equipos puede marcar la diferencia. Nelly – Guardia del equipo Copanecas de Honduras. Se alegra de que la liga Salvadoreña haya crecido y organizado el torneo de la IWFFA. Además indica que aún se deben discutir algunos temas del reglamento. Tiene 6 meses de pertenecer al equipo le parece excelente la oportunidad de jugar con equipos de otros países y que han aprendido y esperan que ese torneo se vuelva a repetir. Trish Wall plays for the 8 on 8 team: “Legit”, who are undefeated champs and ranked #1 in the northwest. She also fills in to play 5 on 5 for another team in the tournament: Roseberg Respect . The Salem Freedom Bowl: Teams competing (6 women’s) Eugene Reign, Grants Pass Legit, Grants Pass Tight Endz, Medford Empire, Salem Blitz, Seattle 20Pick6. The tournament has two divisions: Top Flight Division (Grants Pass Tight Endz will take championship) and Competitive Division (Seattle 20Pick6 will take the championship) and allows for teams to borrow players during the competition in order to compete. “Players just want to play, and get better in the sport” says Trish. Teams have so much camaraderie amongst each other. The league started co-ed, then went gender specific with 5 on 5, and today offers both 5 on 5 and 8 on 8 style of play. Trish says 5 on 5 builds skills for the 8 on 8. “All styles of flag football can only help each other”. Laura Lanigan – A “Legit” player talks about the 8 on 8 program, 5 on 5 fading and we get a little bit into the “dynamics” of female athletes vs. male athletes. Coach Simon Lindsay – of the Lady Legit Team – talks about this team, which is a family. The differences between female and male flag football players. Women do not make as many mistakes as men during crunch time or play offs due to ego and lack of focus. Lady Legit players honor decisions coach Simon makes. “The Greatest Teams always Loose”…. find out why. talk to us right off the field with a 14 – 8 win. Winning is everything, no mercy – this is flag football… not ballet. It’s important to keep your drive no matter how weak their competitor team may be. Tips for the new player: Watch football and play whatever flag football you can play. Erica Duley – Captain of Ladies Reign of Eugene, Oregon. Teams are really tight, they mix and mingle. The Lady Regins are a very diverse team – players on the team are so different. They play both 5 on 5 and 8 on 8. 80% of the team are mothers, who really have made such a commitment, bringing their children to their practices. All the team’s have male coaches and coaches are allowed to be on the field during the tournament helping teams call their plays. Crystal Myra, Maria Grey, Raquela Johnson, Adrienna, Jacqueline Williams, Rosaria Miller, Cathy Torguesine, Coach Austin – a new team playing just one year. They are using the tournament as a learning experience. They like everything about flag football, the bonding, the flag football family. Their rival team is “Legit ” only because they are undefeated champs. Roseberg Respect Team – Somari Rodrow, Sara, Katy and Stacy – are team mates and coached by Nick Davis who started the team back in October 2016. They play 5 on 5, with contact for the first 5 yards. Even though their team does not play 8 on 8, they filled in an empty spot on the 8 on 8 division. Great sports willing to help the event anyway they can. Nick Davis – co-founder of the league and tournament talks how he and Trish started up all the teams, the west coast union, starting from co-ed, to gender leagues, from 5 on 5 to now in addition 8 on 8. Nick also shares how he believes men’s flag football may be destroying the game. Regarding his female athletes, after one year, the women should be able to coach their own teams and not be so dependent on the men. Nick is driven to building the female flag football player to be independent, less dependent on the men. Giving women the tools, to then go out and be leaders. This is the current Top 10 Women’s teams in the State Of Oregon for tournaments. WFB Talk, on Blogtalk Radio, is looking for a Co-host for the 2015 season. Must love women’s football, willing to discuss various football related topics as well interview our special guests. If you have experience that’s a plus, but no experience is necessary. Send your resume or letter of interest to bj@wfbtalk.com. Be sure to type in the subject line Co-host. 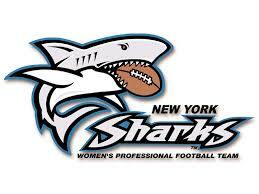 The New York Sharks travel to Pittsburgh to take on the Pittsburgh Passion for the IWFL Eastern Conference Championship. Kick-off 7:00pm-est Saturday, July 12th.